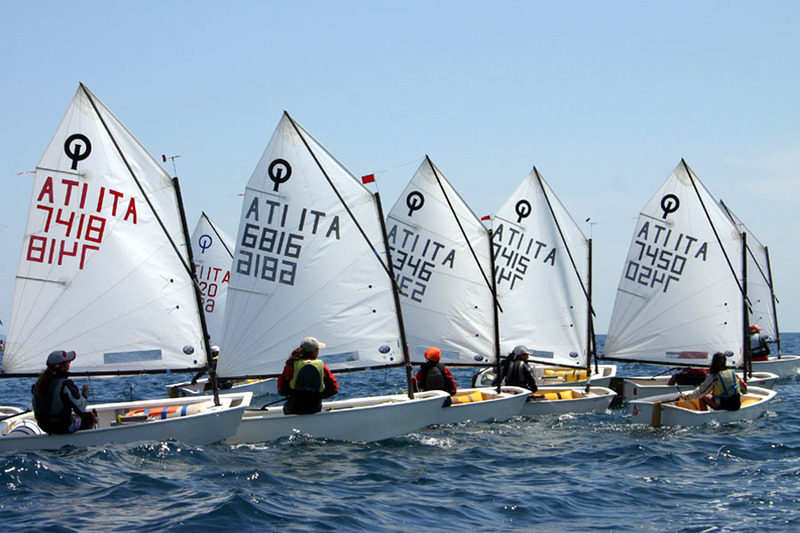 The pride of GVLNI Follonica is and remains the Sailing School to begin the very young and not only to sail or to train athletes for those among them who wants to try competitive sport. In the first case are summer courses, in the second case the activity is for the whole year. Our sailing school is constantly frequented by over 600 people a year and is organized in different levels of courses, from absolute beginners to the more experienced sailors who want to perfect their technique. The the GVLNI provides assistance to denizens of the courses onshore and offshore, rescue equipment, boat and any other necessary equipment. The GVLNI's fleet consists of two FIV 555, boat crew chosen by the National Federation as a training boat and to start to sail, one Marta 5.10 boat crew also connector designed for sailing schools, various Optimist boats single boot sailing for children aged 6 to 14 years, two Equipe, boat crew for experienced athletes aged 10 to 18 years, the Flying Junior, boat crew training for all ages, various Lasers, single boat for sailors also advanced. For the children attending our courses, we offer supervision and entertainment both before and after lessons. From 12.45 (hrs )(lunch time) until 5.00 pm our qualified personnel will supervise the participants and organise activities. Your children will socialize and further enjoy our sailing school! An extra charge for this service is added to the sailing course fee. Meals are also extra. For information and reservations please contact club's secretary. Growth and prestige achieved by this activity are due to the seriousness and preparation of leaders and coaches. All Sailing Schools have a manager responsible for the activity, licensed instructors of 1st Class and various licensed instructors of 2nd Class. Many athletes are grown in our school, some of which have achieved prestigious results: World Champions, European Champions, Italian Champions in various classes. Many of them still continue to bring up the name of GVLNI in world competitions. We do our best to you is only the desire to feel an emotion.